Under the auspices of the 1938 Flood Control Act, the U.S. Corps of Engineers began to pursue an aggressive dam-building campaign. A grateful public generally lauded their efforts, but when they turned their attention to Arkansas’s Buffalo River, the vocal opposition their proposed projects generated dumbfounded them. Never before had anyone challenged the Corps’s assumption that damming a river was an improvement. 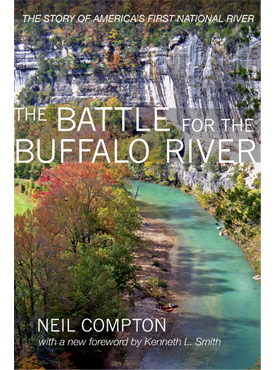 Led by Neil Compton, a physician in Bentonville, Arkansas, a group of area conservationists formed the Ozark Society to join the battle for the Buffalo. This book is the account of this decade-long struggle that drew in such political figures as supreme court justice William O. Douglas, Senator J. William Fulbright, and Governor Orval Faubus. The battle finally ended in 1972 with President Richard Nixon’s designation of the Buffalo as the first national river. Drawing on hundreds of personal letters, photographs, maps, newspaper articles, and reminiscences, Compton’s lively book details the trials, gains, setbacks, and ultimate triumph in one of the first major skirmishes between environmentalists and developers. Neil Compton (1912–1999) was also the author of The High Ozarks: A Vision of Eden. He received the National Wildlife Federation’s National Conservation Achievement Award and was a President George H. W. Bush Point of Light Recipient for his community service, and in 1990 President Bush presented him with the Teddy Roosevelt Conservation Award. Kenneth L. Smith is the author of Buffalo River Handbook, The Buffalo River Country, llinois River, and Sawmill: The Story of Cutting the Last Great Virgin Forest East of the Rockies. A joint project of the University of Arkansas Press and the Ozark Society Foundation. A portion of the proceeds from the sale of this book will be donated to support the Neil Compton Scholarship in Natural Sciences at the University of Arkansas.